There is somthing about a platform wedge that everyone seems to love. Maybe its the fact that you can have a uber high wedge yet still be able to walk that allures everyone? Who knows, all I do know is that they are cute and versetile. Ankle boots can be worn with almost everything from shorts to skirts. 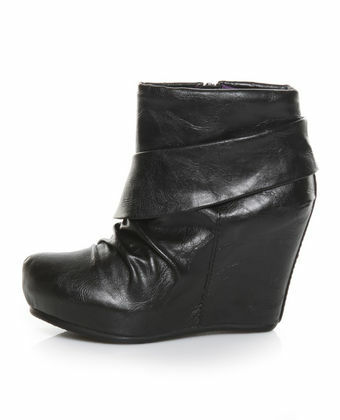 These Are The Qupid Timber 17 Round Toe Wedge Booties. Available At UrbanOG.Com And Lulus.Com. 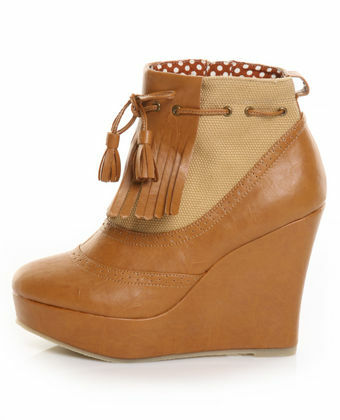 These Are The Bamboo Ceasar-50 Ruched Wedge Bootie. Available At UrbanOG.Com. Blowfish Hanaki Black Faux Idover Ankle Boots. Available At Lulus.Com. The Kiltie Spectator Ankle Boots By Ego And Greed Are Available At Lulus.Com. The Kingston Ankle Boot Available At Bakersshoes.Com. Leave a comment	| tags: ankle boots, Boots, Clothing, cruelty free ankle boots, cruelty free wedge boots, faux leather ankle boots, Footwear, Heel, High-heeled footwear, Sandal, Shoe, Shopping, vegan ankle boots, vegan wedge ankle boots, wedge ankle boots	| posted in Shoes. 5 Ways To Rock A Boyfriend Blazer. Boyfriend blazers go with almost everything but since they are a bit baggy it is important to have something fitted or structured in your outfit to avoid looking as if you are swimming in your clothes. Offest The Looseness Of The Blazer By Rocking It With Some Leggings. Be Sure Your Shirt Is A Bit Long And Loose Since Leggings Are Not Pants And Should Never Be Worn As Pants. By Pairing A Boyfried Blazer With Bellbottoms You Balance Out The Bell Of The Jean When You Add The Looseness Of The Blazer. A Short Tight Skirt Is A Nice Way To Offest A Boyfriend Blazer. The Blazer Also Tones Down The Skirt Making It More 'Day' Approiate. Add A Touch Of Attitude To A 'Girly' Dress With A Boyfriend Blazer. This White One Is Great For The Summer. Boyfriend Blazer With Shorts Is An All Year Round Look. Rock Them With Jean Shorts And Bare Legs And Sandals In The Summer Then Throw On Some Tights And Boots In The Winter. Leave a comment	| tags: Blazer, blazers in the summer, blazers in the winter, boyfriend blazer over a dress, boyfriend blazer with a skirt, boyfriend blazer with bellbottoms, boyfriend blazer with leggings, boyfriend blazer with shorts, Clothing, how to wear a boyfrend blazer with shorts, how to wear a boyfriend blazer, how to wear a boyfriend blazer with a dress, how to wear a boyfriend blazer with bellbottoms, how to wear a boyfriend blazer with skirts, how to wear blazers, Jeans, Shirt, Shopping, Trousers, ways to wear a boyfriend blazer, Wear, what to wear a boyfriend blazer with	| posted in Jackets. Kill ‘Em With Your Spiked Platform Pumps. Since I am obsessed with anything spiked or chained it was a given that I had to own these shoes. The unfortunate part was the first time around every website sold out with the quickness. A couple of places have restocked so I ordered mine and I suggest you get yours. These heels are KILLER. They are very well constructed and they just look fly. The spikes are thick and strong, they will not fall out. The shoe is comfortable, and if you want to make it even better throw in an insole. This Is The Black And Silver Option. This Is The Grey And Silver Version. Leave a comment	| tags: Accessories, Clothing, edgy shoes, Footwear, heels with spikes on them, hot vegan shoes, posh whipped spiked platform pupms, Pump, rock and roll shoes, Shoe, Shopping, spikey pumps, trendy vegan shoes, vegan shoes, whipped spiked heels	| posted in Shoes. Best Sunglasses For Your Face Shape. 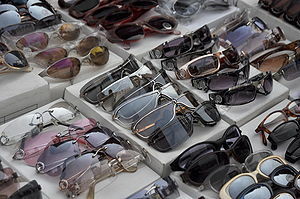 I am a sunglass junkie but it is not always easy to tell which shape of shades you should be rocking. Here are the best shade shapes for the 4 face shapes. What's Your Proper Shade Shape? 1- Oval Face Shape. Since an oval face is pretty well-balanced in proportions you can rock any shape shades you feel inclined to. 2- Heart Face Shape. Heart shaped faces tend to have a broader forehead and a more narrow jaw line. A classic aviator or a semi rimless pair of sunnies will do the trick. 3- Square Face Shape. Square shape faces tend to have more angles on them. To soften them up look for a pair of shade with gently rounded edges. 4- Round Face Shape. Round face shape is a more full face shape. By wearing shades that are rectangular or more geometric in shape you will help create the appearance of a slimmer face. Leave a comment	| tags: Arts, best sunglasses for your face shape, how to pick perfect sunglasses, how to shop for sunglasses, Shape, Shopping, suglasses for oval faces, Sunglasses, sunglasses for heart shaped faces, sunglasses for round faces, Your Face	| posted in Accessories. 5 Ways To Rock Jean Shorts. Jean shorts are the ultimate summer staple and there are so many ways to wear them, even beyond the long days of summer. Throw On A Boyfriend Blazer And A Plain Tank A Top Your Jean Shorts. Finish Off The Look With A Big Bag, Some Flats Or Simple Wedges, Keeping Accessories Small And In The Background. Baggy Tank Tucked Into Short Yet Baggy Jean Shorts Allows A Statement Belt To Steal The Show. Pair With Some Killer Heels And Stacks Of Bracelets. Throwing Tights On Under Your Jean Shorts Is A Cute And Easy Way To Wear Your Jeans Into The. Add A Heavier Blazer And Some Ankle Boots And Your Good To Go. Some People Hate Boots And Jean Shorts, I Happen To Think Its Super Cute. Add A Light Scarf And You Have Another Way To Wear Your Jean Shorts In The Fall. Dress Them Up. Jean Shorts With A Dressy Blazer, High Heels And Plenty Of Accessories. The Perfect Outfit To Go Out To Dinner And Drinks In On The Weekend. I love chains as accessories. I don’t know what it is, I think it’s a combination of a few things. 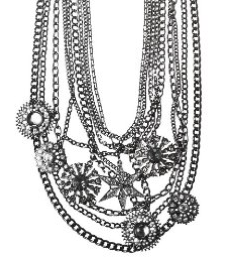 There are so many styles of chains to rock and so many ways to rock them. A chain necklace instantly changes an outfit, try it out. 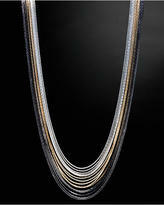 Available At QVC.Com For $20, This Multi Chain Necklace By Susan Graver Comes In Gold, Silver And Gunmetal. Available At AldoShoes.Com, The Philbrick Multi Chain Necklace Is On Sale For $20. 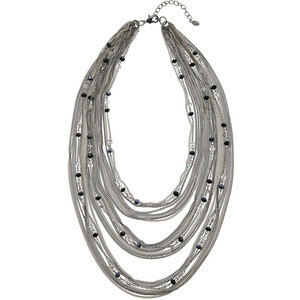 Available At Targer.Com, This Short Chain Bib Necklace Is On Sale For $28 From $40. 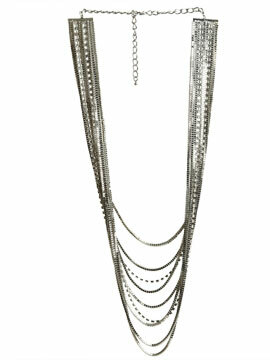 Available At ArdenB.Com This Long Multi Chain Necklace is $29 And Is Buy One Get One Half Off. 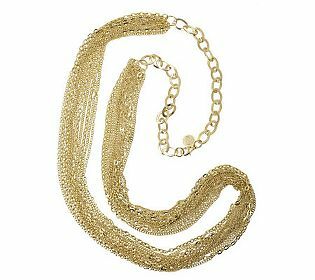 Available At Express.Com, This Multi-Colored Nested Chain Necklace Is $25 And Buy One Get One Half Off. Leave a comment	| tags: aldo chain necklace, aldo multi chain necklace, arden b chain necklace, arden b multi chain necklace, Business, chain necklaces, chain necklaces at targer, express multi chian necklacea, Jewellery, Jewelry, mulit chian necklaces, Necklace, Pendant, QVC multi chain necklace, Shopping, target multi chain necklace	| posted in Accessories. 5 Ways To Rock A Wrap Dress. A wrap dress is timeless and classic. I have one I do not wear often enough and I want to change that so I sent out to find different ways to rock the wrap. Turns out this dress is pretty darn versatile and I plan on wearing mine soon. Throw A Belt On It. Instantly Update Any Wrap Dress With A Colorful Belt. An Easy And Cheap Way To Create A New Look With Things You Already Have In Your Closet. Throw On A Blazer In The Color To Achieve A Professional And Pulled Together Look. This Look Can Easily Be Worn To Work, Just Remove The Blazer And Add Some Gold Earrings And Some Bracelets For Happy Hour. Throw On Some Opaque Black Tights And Knee High Boots To Form This Modern Look. ThisOutfit Is Perfect For Day Or Night, Add A Cropped Pleather Jacket And Your Good To Go Wherever, Whenever. Add Some Color To A Black Wrap Dress With Colored Opaque Tights And A Matching Cami Underneath. Red And Black Is A KILLER Combo, That Exudes Both Boldness And Confidence. Top It Off With Some Faux Leather/Suede Ankle Boots And It's On. Accessorize The Crap Out Of A Black Wrap. Go All Out. Throw On Earrings, A Necklace And Armfull Of Bracelets. Add A Killer Clutch, A Belt And Some Killer Shoes And You Are Good To Go. Perfect For Dinner, Drinks Or Just Kicking It City Style On The Weekends. Leave a comment	| tags: a dress every woman needs, Boots, classic dresses, Clothing, different ways to wear a wrap dress, Dress, easy outfits, easy to wear dresses, Footwear, how to wear a wrap dress, Leggings, Little Black Dress, making outfits with clothes you have, Shopping, Tights, timeless dresses, wrap dresses	| posted in Dresses.